Finding a waterfront restaurant San Fran style shouldn't be difficult, as this city is beautifully set on the bay. However, choosing which one to eat at first can pose a definite challenge! Read on for ideas on finding the best restaurants in San Francisco, and get the best views of this water-lined city at the same time. San Francisco is known for its diverse dining options, offering an array of international cuisine that may be considered rare by other cities' standards. Above and beyond the cultural fusion of eateries, many restaurants are lined by gorgeous bay views making for a perfect romantic meal, or even a great time of discovery and dreaming for families with children. Since San Francisco has so many choices, it is best to decide what type of food you want to eat while you are staying in the city. Are you a vegetarian? Would you like to experience a taste of a nationality you have never encountered? Now is the perfect time. Below are some of the best waterfront restaurant locales that San Francisco has to offer, each one ranging in both price and menu style. The Cliff House is not just a restaurant - it is a San Francisco historical site as well. Here you will find all of the local favorites, from the city's famous clam chowder to Chinatown-influenced appetizers. Cliff House actually offers two restaurants - the upscale Sutro, and the more casual and reasonably-priced Bistro. Both have incredible ocean views and the chance to relax while sampling authentic Bay Area cuisine. As one of the most recognized vegetarian restaurants in the country, those who are looking for a healthful menu can dine at tables overlooking the Golden Gate Bridge marina. Located at Fort Mason near the Marin Headlands, patrons to Greens can expect to pay around $50 per person at this posh eatery. 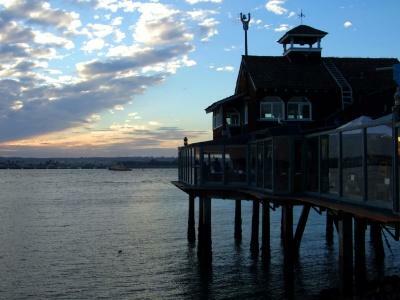 Situated in Tiburon, many argue The Caprice is the only restaurant that rivals Greens in terms of waterfront views. However, this is a destination for meat eaters, with their wide variety of steak and seafood. Their shellfish sampler is impressive, offering a huge platter of local crustaceans perfect for sharing as an appetizer. Dress code at The Caprice is broad, however it's recommended you gussy up a bit if you are going out for the evening. Cityscape Bar & Restaurant is located inside of the San Francisco Hilton, and from the 46th floor, the waterfront views are like no other. Cityscape holds bragging rights as being one of the city's only rooftop dining rooms, and they are open late for those who want to come just for the champagne. If you've never traveled to a waterfront restaurant in San Fran before, you may want to take advantage of these tidbits of advice guaranteed to give you a memorable dining experience. Dress warm - San Francisco can get cold. In fact, it can feel downright freezing if you find yourself eating on a bay view patio. Known for its gusty ocean winds, you will want to dress warmly if you plan on dining near the water, especially in the winter and spring. Look to restaurants for nightlife - Nighttime is when the locals come out to play. San Francisco has a tremendous night life, and it isn't uncommon for restaurants to turn into bars and dance floors as the evening wanes into late night. While more upscale restaurants will see no difference, local hotspots such as the Cheesecake Factory and the Starlight Room can quite easily transform into a crowded bayside circus. Do research before Marin dining - If you venture into Marin County (customarily by crossing the Golden Gate Bridge), restaurant rules are different. Many Marin eateries do not offer free refills on soda, for example. Check out menus online if possible, so you won't end up spending more money than intended, and so you know what the proper etiquette is for this area that is associated with - but remains apart from - San Francisco.